BASC wants to help you be ready for the upcoming season. Below are coaching courses that are available to you before the season starts this fall. What's even better than having the courses available to you as a coach? They are all being held at the Indian Springs Soccer Complex! DESCRIPTION : Experienced Club Coaches will give instruction on Team Management and demonstrate efficient practice techniques to use during practices. Shortened training sessions with players around your age group will be ran to deminstrate the new techniques. DESCRIPTION: Small-sided initiative training is being offered by US Soccer for U6 - U19 age divisions. Each course consists of a 4-hour course at Indian Springs Soccer Complex. Two hours will be taught in a classroom and two hours will be on the field. Coaches must first complete a free introductory module, which represents the first step in the newly revised coaching license pathway and is a required prerequisite to undergo any of US Soccer's Grassroots Licensing Courses. Coaches who complete the module will also be provided with four complimentary Play-Practice-Play training sessions. Click here to sign up for a free account with US Soccer's Digital Coaching Center. Then, click here to register for Introduction to Grassroots Coaching. Click here to register for the 4v4 course. Click here to register for the 9v9 course. Click here to register for the 11v11 course. 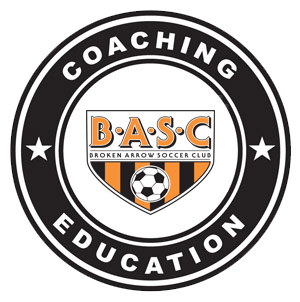 ** BASC will reimburse all coaches who provide us with a certificate of completion. Please email this information to info@bascok.com to request reimbursement. Target for this course is U13-U15. Or, in the USSF Curriculum, where the full 11v11 starts to be played and real Functional Training where the goal is to get two lines of players in the system to improve. Preparation Phase: There are some pre-course assignments that must be completed before the first Friday evening class. So, the earlier you register, the easier it will be to get them all done. Instructional Phase: During the first weekend the National Coaching School Staff will go over the vast majority of the USSF curriculum. Methodology, philosophy, demonstration of teaching techniques, etc. Deliberate Practice Phase: This is why there is two months between the two weekends. It is time to go away and put into practice the concepts and methods that were discussed during the IW. You will have some assignments to complete during this time period, so it will be critical that you have access to a team to run a session or two.